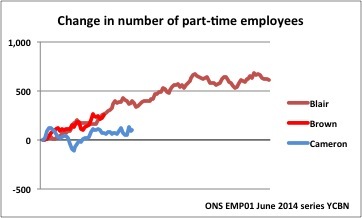 Fraser Nelson's updated article for the Spectator here continues his presentation of UK employment levels comparing changes by Prime Minister. I looked at the impact of arrivals from abroad on these numbers for Blair, Brown and Cameron here on both levels and rates of employment. Those figures only come out quarterly, so an update on that aspect will have to wait. 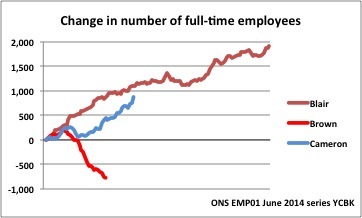 But to continue tracking the extent to which the relative proportions of full-time and part-time work have changed and the proportions of employee and self-employed, updated pictures below using series from the ONS on the same seasonally-adjusted basis as Fraser's MGRZ. Firstly the change in numbers of full-time employees in thousands. 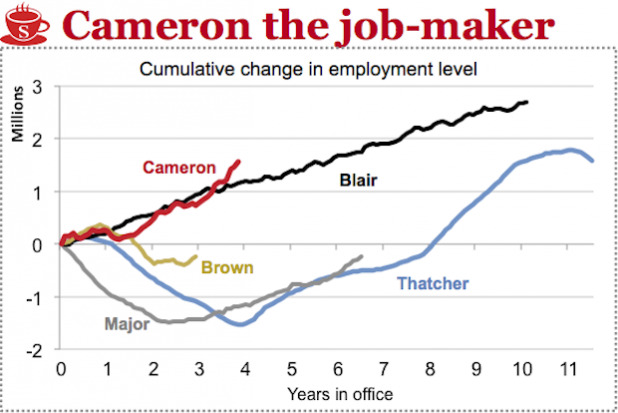 Cameron is still behind Blair in creation of full-time 'pay packet' jobs, but making up ground. This one shows that Blair employment growth comprised a large amount of part-time employment, about a third of total growth by number. In contrast, the numbers under Cameron are barely significant, and continue to bump along near the bottom as the smallest component of change. 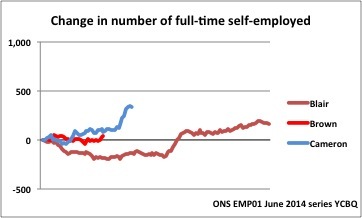 In contrast, and as much reported and puzzled over, here is the 2013 upsurge in full-time self-employment under Cameron. I noted previously that the pace and magnitude of the most recent change was not unprecedented, but that previous change on this scale was not sustained, and suggested forecasters might do well to be cautious before calling a structural change. These numbers have come off the boil in the most recent figures from the ONS. 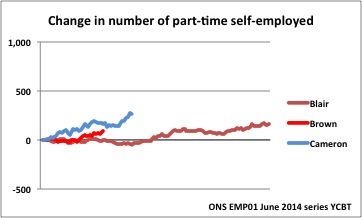 Increases in part-time self-employment had been greater and sharper than previously, but as with full-time self-employment at least a pause in growth of this component of overall change.